Architect and friend of AN Jeremiah Joseph writes in with this report of the March 27 WORKac lecture, “Shovel Ready,” at Parsons. Amale Andraos and Dan Wood, of the 2008 PS1 Warm-Up pavilion fame, tag team presented their work to a standing room only crowd. With a range of projects, from buildings to urban proposals, the duo showed the office’s penchant for both intelligence and wit. Like many young offices most of WORKac’s work is still in the realm of unbuilt projects, but with five competitions already completed in 2009 this office has no intention of waiting around casually for the work to knock on their door. Of the work presented, two New York buildings showed off the office’s intelligent concepts executed through reduced forms. They push the ideas, but are careful to not allow overly exuberant design blur the intent of their work. The Headquarters’ for Diane von Furstenberg in the Meatpacking district showed their aptitude for laying out simple concepts that are translated, quite directly, into built reality. The project uses the stair, one of the most commonplace and yet ceaselessly studied elements in architecture, to turn what could be a mundane office building into an object of both clarity and poetry. Starting at the ground floor entry the stair slips up through the old warehouse building to reveal in single moment the sky above. A relatively simple move, but deftly handled, it flips the reading of the building’s dark brick exterior by lighting the interior and yet at the same moment pulls visitors sense of the space up, through, and out the roof. In their proposal for the Kew Gardens Library in Queens (a project soon to start construction) WORK ac inverts the interior methods of the Diane von Furstenberg HQ by wrapping an existing building with a new facade and roof. Expanding the building’s footprint towards the street they apply a new double-bent gull wing roof covered with flora. The new form, boosting the height of the building and allowing clerestory lighting into the interior, is clad at the upper portion of the facade with pre-cast concrete panels and new, open curtain wall down to the street. It is important to credit New York City’s Design and Construction Excellence program for allowing WORK ac produce a project like this. It may be a bit self-serving to suggest this project gives hope to the architecture community that it will be able to continue producing good/smart/important work during a time of economic turbulence. But with the likely (and potentially healthy) collapse of the opulent condo market, the program sends a positive message to the community-at-large that quality design benefits everyone, not just the wealthy few. Of the work shown it was interesting to see that to date WORK ac is strongest in their urban proposals. The Green Belt City competition for Las Vegas started off with clear-minded analysis of the site issues. By the middle of the presentation they revealed their OMA pedigree, a tendency to tackle problems as the witty prankster who actually does know best. Yet at the end they zoom past overly reduced forms and slight of hand design moves to produce something both smart and beautiful. With their final project, a preview of a competition yet to be made public, they showed an amusing foray into the world of paper architecture. The project, a tower in lower Manhattan, was commissioned as a real world study of an urban condition, but the architects believe they, the client, and the architecture community are best served by going for broke. With an appropriate suspension of disbelief they stack and pin-wheel a series of slabs composed of archetypal sections of the city’s urban fabric onto a hyper-eco-energy-friendly core. Although little of this piece itself is feasible, WORK ac likeably reveals untapped potentials in tower design and brings to light the potential for subtler, real-world solutions that would be just as relevant and powerful. With the amount of work produced so far it is a good bet WORKac will continue to generate engaging architecture. A risk the office faces is becoming typecast as new eco-architects. Although this may help bring attention, and put work on their boards, it would be too narrow of a category for their talent. An exhibition on WORKac is on view at Parsons The New School for Design, 25 East 13 Street, Second Floor, through April 18. 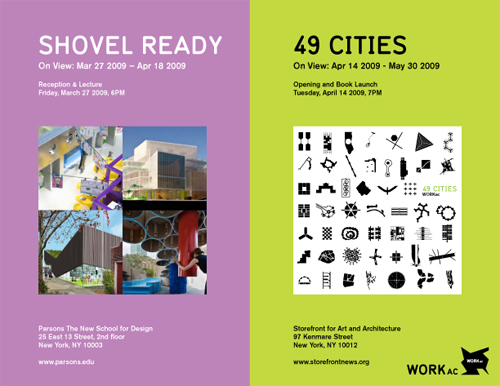 A second exhibition, called 49 Cities, will be on view at the Storefront for Art and Architecture, 97 Kenmare Street, starting on April 14.